A little over a year ago, a new social service called “on wheels” appeared in the Republic of Moldova. The idea behind the service is that mobile teams consisting of psychologists, kinetotherapists and social workers visit families that have members with special needs and help them to solve their daily problems. We visited one of five regions where the service is currently in operation and learned how the lives of people who have used the service have changed. The office of the mobile team in Căuşeni is located in the same building as the local prosecutor's office. The service's employees do not get to spend too much time there, though, as mobile teams spend four out of five working days on the road. The head of the local service, Christina Chubuk, says that it was impossible to cover all the families in the region that had a member with special needs. While processing applications, families who live in remote villages that do not have polyclinics, doctors or social assistants are selected. As a rule, three specialists – a social worker, a psychologist and a kinetotherapist – and a driver travel around the region. Each family that the mobile team works with is visited by the specialists twice a month. The first stop is Taraclia village, which is located 24 km from Căuşeni. The mobile team has been coming here over the course of the entire year to visit the Oprya family. Vlada, the youngest of three children, has Down syndrome. “When she was born, nobody explained anything. They said that the child was sick and that she needed massaging and that was all,” recalls Vlada's mother, Nadezhda. Since then, she has been trying to take her daughter to see doctors in Chișinău. “Our doctors in Căuşeni immediately recommended sending her to boarding school, because she was ‘sick,’” she says. 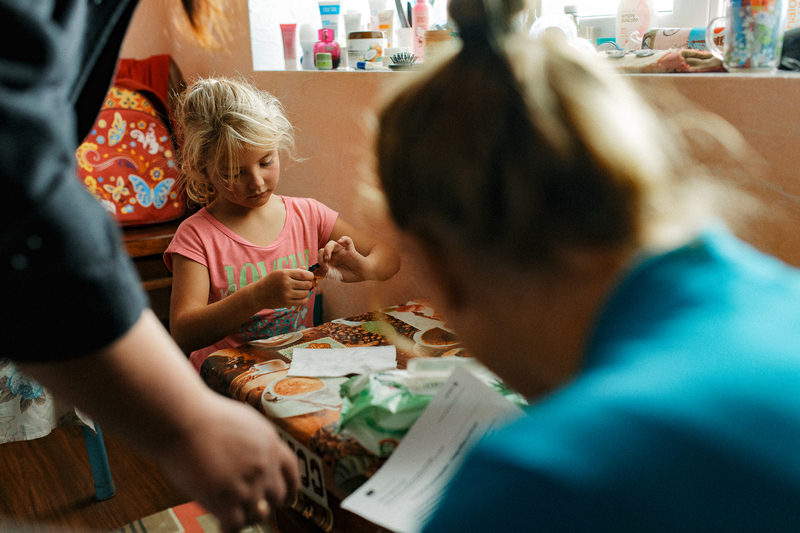 In three years, Vlada has already undergone two surgeries: one on the heart and another on her spine, due to diseases caused by the syndrome. Her mother has to be with her constantly. Her father, on the contrary, is often away from home. Due to the lack of work in his native region, he is forced to work abroad in order to support his family. Nadezhda stays alone with her three children, the oldest one of which is 10 years old. The mobile team's psychologist and kinetotherapist have been working with Vlada for a year, helping her to improve her fine motor skills. However, psychologist Kristina Moisey says that at the moment, Vlada's biggest problem is her poor eyesight. Because she practically cannot see, Vlada is afraid to walk, even though she would be able to, and quickly gets exhausted from straining her eyes. The mobile team have twice taken Vlada and her mother to the “Low Vision” centre for the visually impaired in Chișinău. The centre provided special glasses for Vlada free of charge. The first pair of glasses did not improve the situation, but with the second pair, Vlada started to react better to things happening around her. 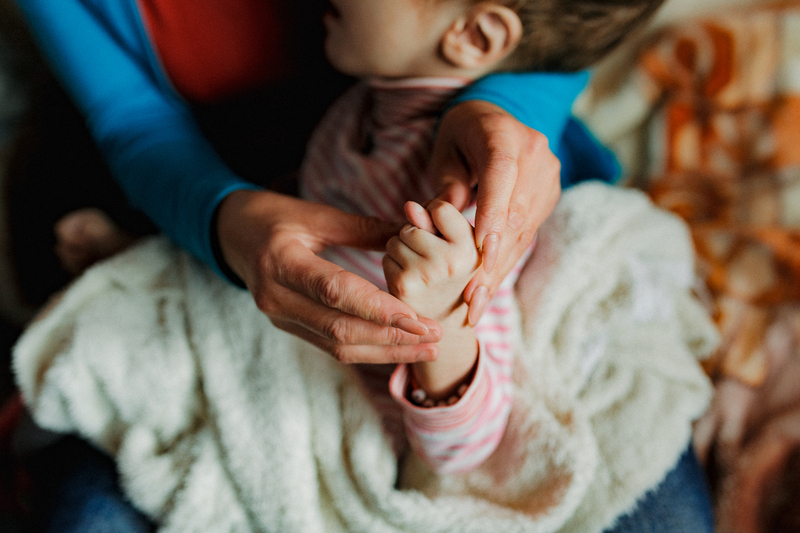 According to the team’s social worker, Eleonora Barkar, Vlada's mother has not yet managed to be attributed personal assistant status for her daughter: “The waiting list is quite long and the commission usually selects even more complicated cases,” she explains. The status would allow Nadezhda receive a salary for looking after her daughter. The psychologist told her that she should try to take her daughter outside for at least half an hour each day, create a visual card with her daily schedule and continue developing her sensory capabilities. 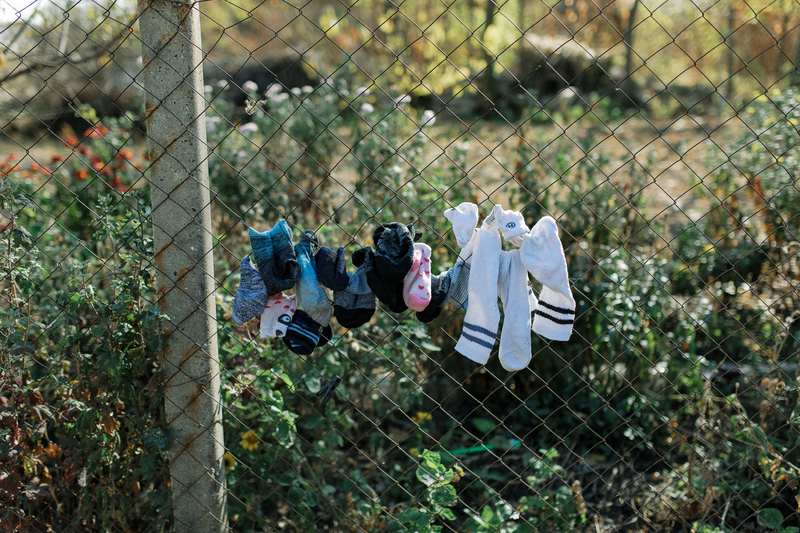 After bidding farewell to Nadezhda and Vlada and leaving some therapeutic toys behind for them, the mobile team moved on to the neighbouring village of Baimaclia. Diana Leu and her two daughters live there. There is no proper road to their house, so the social service's car has to plough down the gravel track. The younger daughter, Yekaterina, has hydrocephalus. She cannot sit or move on her own; she does not speak and has very poor eyesight. Katyusha, as her mother calls her, discovers the world through her sense of hearing and touch. 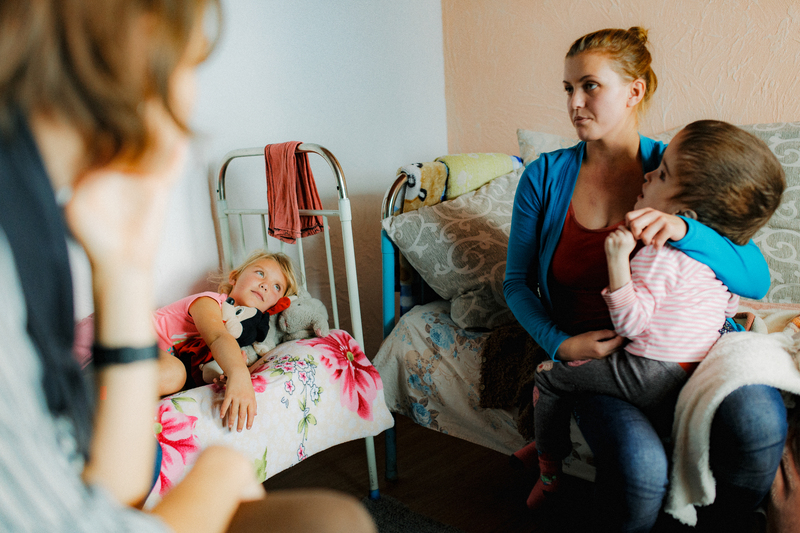 Having learned about Katyusha’s diagnosis, her father left the family. “I do not know what is going on with my ex-husband, I do not hear from him at all. My mother-in-law is paying the maintenance, I do not complain,” Diana says. She is not used to complaining. After her divorce, she had to move in with her daughters to the old house that used to belong to her grandparents. At that time, the house was practically unfit for living. For a long time, all three of them were cooped up in one tiny room, which also served as a kitchen. The older daughter, Masha, did her homework in there too. Diana's parents helped her renovate the place and restore another room. She hopes that this winter it will be warmer there and Katyusha will not catch a cold as often. Diana admits that she used to help her daughter rely on her own instincts and intuition. “Now, they showed me how to give her a massage properly and what else should be done. We are slowly and gradually learning. She feels me and I feel her,” Diana shares as she reflects on the results of the work with the mobile team. According to Diana, after a massage, Katyusha becomes more active and reacts better to things happening around her. The child smiles, so as to confirm her mother’s words. Besides the maintenance from her ex-husband’s mother, Diana receives a monthly social payment due to her daughter’s disability of around 600 lei per month (approximately €30). “I am grateful for this as well; it is enough for nappies. It would be worse if we did not receive any money at all,” she says. 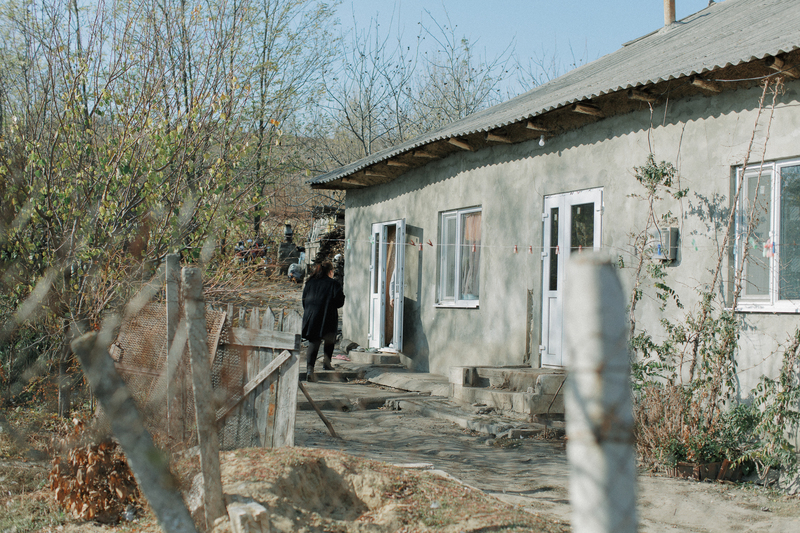 Last year, thanks to the efforts of the mobile team's social worker, they managed to get financial assistance from the Căuşeni district council, and a washing machine and firewood have appeared in their house as a result. Diana hopes that soon they will manage to find a special wheelchair for Katyusha. Currently she takes her daughter out in a regular pushchair, but she won’t be able to do this for long: Katyusha only fits in it with her legs tucked in and quickly gets tired. Unlike the family in the neighbouring village, Diana has managed to obtain personal assistant status. Her salary after all taxes are deducted is about 1,100 lei per month (approximately €56). The young mother is aiming to maintain a positive outlook. “In Căuşeni, doctors constantly say: ‘Get ready for the worst.’ But I, on the contrary, see changes for the better. Katyusha is happy: she is feeling better, she does not get sick as often and she is developing. ‘No, do not keep your hopes up,’ the doctors say. But the child feels everything and she is also fighting for her life. If mum does not believe, then who will believe in the child?” says Diana. 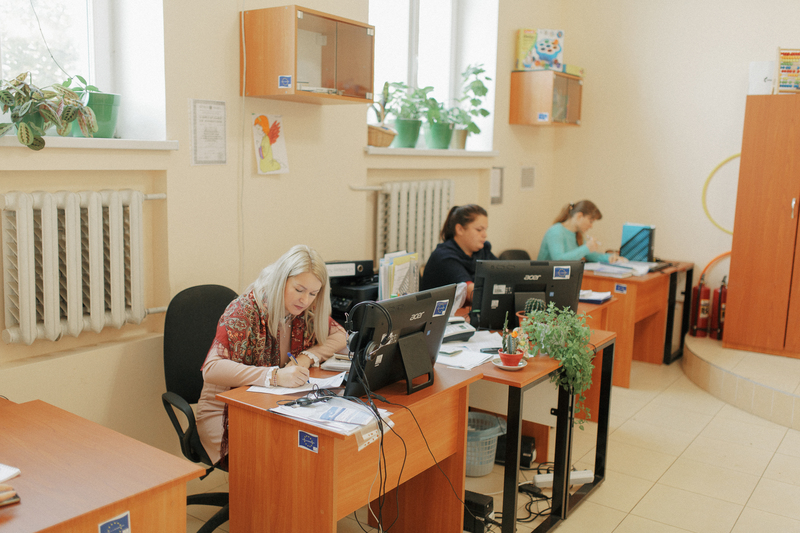 As it stands, five mobile teams are working in Moldova. Besides Căuşeni, such services are available in Gagauzia, Ștefan Vodă, Tiraspol and Slobozia. 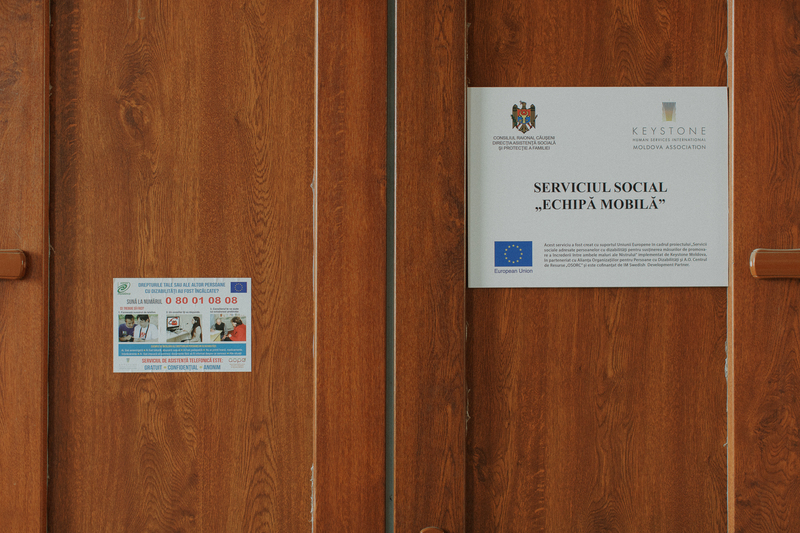 They were created in 2017 with financial support from the European Union through the project “Social services for people with disabilities to support confidence-building measures between both banks of the Dniester”. Thanks to the project, it became possible to equip an office, hire and train specialists and buy cars to visit the families. As of the second half of 2018, the work of the mobile teams is funded by the local authorities. The services' expenses will be covered by district budgets. The mobile teams were created in places where there were practically no social services for people with special needs. “Our task is to improve their quality of life, so we do not allow them to be marginalised or sent to special establishments. 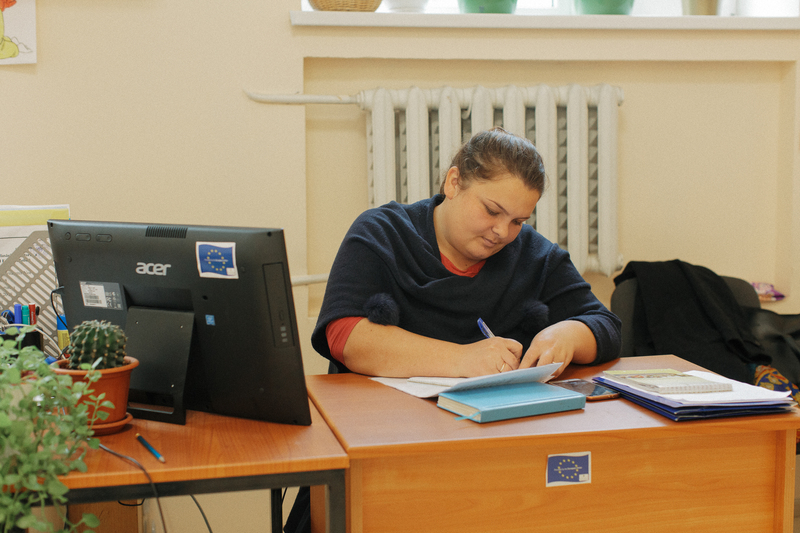 In Moldova, people with special needs stay at home most of the time, they are not seen by anyone; parents seem embarrassed by them,” explains Chubuk, the head of the service in Căuşeni. According to her, it’s often the case that village family doctors do not even know they have people with special needs in their district. The mobile team members help their patients acquire skills for everyday life, as their parents are taught how to properly work with their children and develop them further. Chubuk is convinced that without this cooperation, there would be no success. “Sometimes, parents do not even notice that the child has started to feel something, hear or discover the space around them. They simply get used to the idea that their child is sick and do not help the child develop. Our job is to support them and convince them that the more they invest, the more results they will see,” psychologist Moisey says. This year, one mother even refused to send her child to boarding school thanks to the mobile team. The service helps to solve simpler problems too. Social worker Barkar says that in the last year they have managed to get financial assistance from the district council for their five patients and helped three families with their documentation in order to be eligible for social payments. One of the service's patients even obtained a passport, for the first time in his life. Previously, his mother used to think that if he does not leave the house then he does not need any documents. 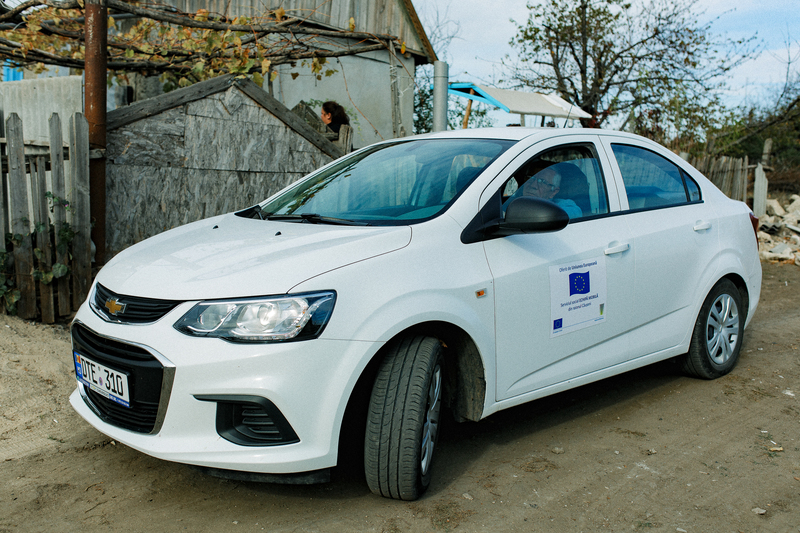 The team managed to send another patient to a health resort for treatment, while other patients were taken by the mobile team to the Low Vision centre in Chișinău. In some cases, necessary medication is also purchased using the service's money. “The parents need some kind of a push and control, so they understand what needs to be done and so that they can develop their child further. We are a bridge for them to move to another level,” Chubuk explains. “We help parents accept the situation they are in, but also not to give up and persevere,” summarises Barkar. According to the regulations, the mobile team can work with a specific family for no longer than a year. About 25 families, each selected based on their application, have so far been able to benefit from the service's help. 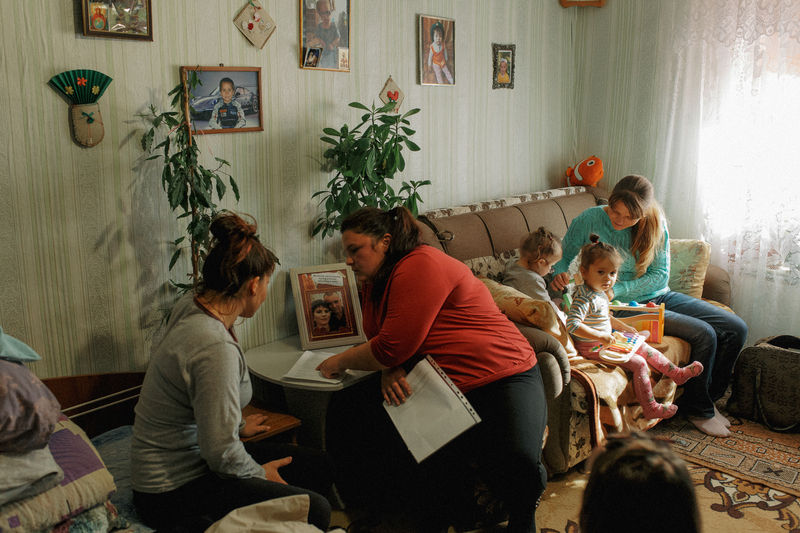 Nevertheless, according to the data of the local mobile team, in Căuşeni district alone, there are around 350 children and 2,800 adults with special needs. In the nearest future, the mobile team of Căuşeni district will start working with 15 new families from other locations.